A crucial cameo appearance by Bradford super-sub James Walshaw changed the course of a match in which a two-goal half-time lead proved insufficient for the Magpies. 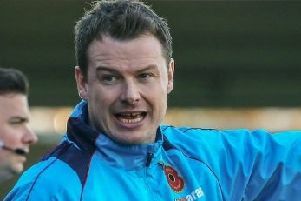 Chorley ran out of steam in the last half-hour of an energy-sapping National League North contest. Hot-shot Walshaw bagged two goals, his point-saving second arriving a minute into added time. Chorley were hugely impressive in the first half on a heavy pitch, their high-tempo play repeatedly carving open an uncertain Avenue defence, who contributed to their interval deficit with some careless distribution. The rampant home side, however, found a potentially match-winning third goal elusive and wilted as Bradford raised their game in the second half to claim a deserved point. The Magpies raced into the lead after four minutes. A careless square-pass out of defence was seized upon by Darren Stephenson, who promptly cracked a low 25-yard drive into the corner of the net. Then on 15 minutes, Avenue keeper Jon Stewart threw the ball out down the left, only for Mark Ross to intercept and release Josh Hine. James Dean cleverly stepped over his low centre, wrong-footing the visitors’ defence, and Chris Doyle made no mistake in firing past Stewart. Though often overrun, Bradford had their moments in attack. A clever back-heel sent Chib Chilaka through but he could only shoot straight at Sam Ashton. Chorley should have had a third when Dean was sent clear but he could not squeeze his shot past Stewart, who pushed the ball aside into the path of Hine who incredibly missed the target from three yards. Avenue escaped again after Stewart dropped a Dale Whitham drive. A scramble in front of goal ensued before the ball was hacked to safety. Tactical changes and effective use of substitutes galvanised Bradford in the second half and Chorley were slow to sense the danger. They were lucky to escape a penalty when Chilaka went down under challenge from Ashton. But it looked a soft award when the referee did point to the spot after 72 minutes. Walshaw, minutes after entering the fray, went down very easily with Doyle in attendance and stepped up to score comfortably from the penalty. The Magpies’ goal attempts were now drying up, the best of them a fierce on-target drive by Ross, which Hine unwittingly deflected high and wide. Fresh legs would have served Chorley well in the closing stages and they were finally undone in added time. They failed to retain possession from a throw-in deep in the Bradford half and the visitors broke quickly. Alex Pursehouse whipped in a dangerous cross to the near post which the opportunist Walshaw met with a perfect glancing header past Ashton. It was a hugely frustrating end for Chorley but few would deny that Bradford’s brave fightback merited a point. “I’ve seen the video and it was never a penalty,” said Chorley boss Matt Jansen afterwards. “It’s given Bradford a bit of belief and put us on the back foot.